Today's color challenge on SCS was Close to Cocoa, Bashful Blue and So Saffron. These were perfect colors for me to use with this sweet House Mouse image for the Monday HM challenge #32. The HM challenge was to use the theme of sweet.... it could be a sweet image, the word sweet... or anything else that had to do with "sweet". I used this cute Stampabilities image of the mice popping corn over the birthday candles. I thought it was sweet in itself, but just in case (LOL) I added a "sweet" sentiment from Studio G.
These colors are soooo pretty together! I used my SU! Delicate Dots DP. I thought the So Saffron pattern almost looked like popped corn! My accesories are pretty simple... bashful blue and so saffron ribbons, tied with a silver cord, and clear glitter added with Stardust clear glitter gel pen. This card is going in the mail right away. I got behind trying to make Easter cards and almost let an important birthday slip by! Thanks for stopping by my blog! I hope you enjoy the visit and come back again soon! What a cute card! It's so great that you were able to fulfill two challenges with it. Your round tag with sentiment is perfect. what a beautiful card Grace,l love the image. I don't think you could make a card anything less than sweet. Very cute image and I didn't even tackle the color challenge because I couldn't think of anything, this is perfect for it. This is a really cute card, love the colors! Grace ...just found your blog . 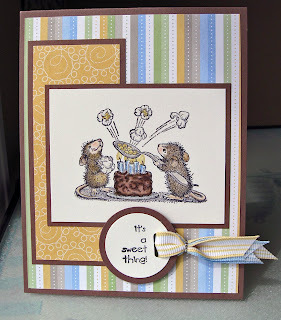 Adorable card... enjoyed scrolling down to see your creations ...love your blog title and layout ! Great job . So nice to see another Christian sister too ! What a fun image Grace. The colours work perfectly together and I love how you incorporated the ribbon. Grace this is so sweet and just darling. Great layout and colors. That mouse is so darn cute! What a gorgeous card Grace. Fantastic layout, colours and papers. What an adorable fabulously coloured image. I just got this stamp myself - love it! And I participated in my first House Mouse challenge too ....these are some of my favorite stamps! Good job! Adorable card. One of my favorite House Mouse images. I like that you made the frosting chocolate. Love your layout and colors. I love this color combo! Such a pretty card. That DSP is just perfect for use with House Mouse images!!! I love it!